Tigers centre makes a break during their final game for the 2018 season against Warialda last Saturday. Congratulations to Brendan Minns, his family, the Landers family and a small but dedicated committee who organised the celebrations marking the Centenary of football in Tenterfield last weekend. It was an outstanding effort. Presidents of most organisations regularly get more brick bats than bouquets and I know that has often been the case for Brendan and the Minns family in general. It is criticism that is totally uncalled for and Brendan and Co should all take a bow for their efforts. Not just for pulling together the 100 year celebrations but for their tireless work to keep rugby league in Tenterfield alive and well against the odds. 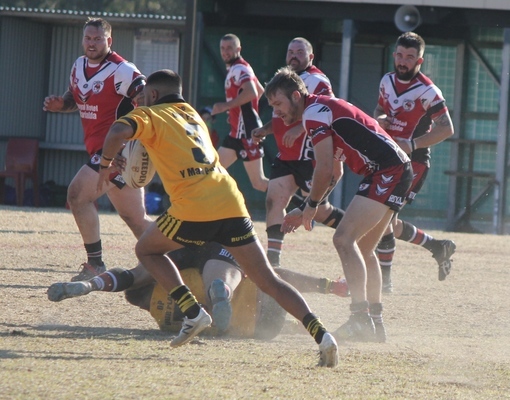 The Tigers did not manage to win a tough encounter against Warialda on Saturday in what was ultimately their final game of the season the team can hold their heads high as they played a great game against quality and tough opposition. The Tigerettes also were beaten in a tough game but were declared winners by everyone at the Memorial Hall function on Saturday night where the team had spent many hours on the decorations. Guest speaker Billy Moore of Wallangarra, Tenterfield and Stanthorpe fame that came well before the North Sydney Bears, Queensland and Australian recognition spoke passionately of the impact that Tenterfield Club had on his playing career. The man who is responsible for the immortal “Queenslander” call to arms paid tribute to the club which gave a kid from Wallangarra opportunities as a junior which impacted directly on what evolved into an outstanding career. As former players from across a multitude of eras traded stories, executed pin point passes, tackled and ran hard, scored extraordinary tries – dumped the occasional ref in the creek behind the Showgrounds, celebrated Premiership wins and narrow defeats, I was reminded once again of the important place rugby league plays in country communities. To a person players, officials and supporters, past and present who I spoke with strongly believe that it is well and truly time the boffins in the executive offices at the top of the NRL listened hard to the calls of country rugby league across this country. If they do not it is highly likely in another 100 years clubs like the Tigers will not be around to celebrate anything but distant memories and that would be a tragedy.